Adam was a public health Specialty Registrar in Oxford when he started his fellowship. He had previously completed a clinical Wellcome Trust Research Training Fellowship, earned a PhD for his investigation of the cost-effectiveness of public health policies, served as a junior research fellow at Lady Margaret Hall and was a Senior Hulme Scholar at Brasenose College. 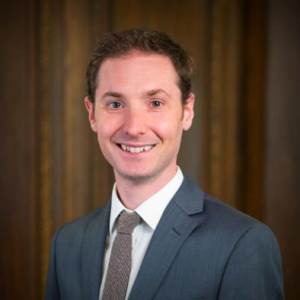 In his earlier career, Adam was an NIHR Academic Clinical Fellow in Public Health Medicine and helped establish a public health strategy for Oxford University Hospitals NHS Foundation Trust. His previous research includes estimating the health impact of soft drink taxes and serving as an expert collaborator on the Global Burden of Disease Study. In addition to multiple peer-reviewed publications, he co-authored the physical health chapter of the Chief Medical Officer’s 2015 Annual Report, and published a book on practicing public health. During his fellowship, Adam was based at The Dartmouth Institute for Health Policy and Clinical Practice where his study topic was “Learning Lessons from Accountable Care Organizations to Improve the Delivery of Preventive Care in the U.S. and England.” The Patient Protection and Affordable Care Act (ACA) was intended to both increase health insurance enrollment in the United States and improve population health. This included the trialling of various alternative payment models, with one such model being Accountable Care Organizations (ACOs) – groups of health care providers who are collectively accountable for the overall cost and quality of care they provide. Given that there was little published research on the effect of ACOs on disease prevention, Adam wanted to better understand ACOs’ major enablers and barriers to the implementation of effective disease prevention screening, interventions, and follow-up. He also wanted to determine if any lessons learned could be applied in the NHS, as it develops its thinking on integrated care and the development of ACO-like models. His research focused on patients with complex clinical needs who may experience barriers to accessing preventive care services and who account for a disproportionate share of heath care expenditure. Adam’s research suggested that care management programs for patients with complex clinical needs and annual wellness visits were important mechanisms used by ACOs to deliver preventive care services. And having high capabilities in care management and quality improvement were likely necessary, but not sufficient, for achieving high preventive care quality performance. Instead, other facilitating factors were important such as a fully integrated electronic health record across member organisations and having staff education programmes – aspects of integrated care reforms in England that are often still being developed. Furthermore, Adam noted that achieving high quality scores and other routes to financial gain were important motivators for ACO behaviour. This is potentially relevant for the NHS in England as it develops outcome frameworks for Integrated Care Systems. Since his return Adam has started his final year of training as a public health registrar and is currently on a six-month placement with The Health Foundation. Adam is working on how England’s integrated care reforms can best be used to improve population health and is hoping to apply much of his learning and experience as a Harkness Fellow to this work.